These electrodes most often are used to weld dissimilar metal compositions of which one component is higher in nickel. 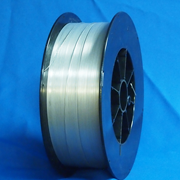 This alloy gives a two phase weld deposit with substantial amounts of ferrite in an austenite matrix. Following the chemical composition designation comes the letter “T” which signifies that the product is a flux cored electrode or rod. Following the “T” is a “1” or “0” indicating the recommended position of welding. The “1” or “0” following the “T” designates the following: “0” – designed to weld in the flat or horizontal position, “1” – designed to weld in all position. Following the position indicator and a dash, are the numerals “1”, “3”, “4”, “5”, or the letter “G”. The numerals “1”, “4”, and “5” identify the shielding gas required for classification of the electrode. The number “3” signifies that an external shielding gas is not employed. The letter “G” signifies that the shielding medium, chemical composition and mechanical properties are not specified.